"It seems to me that our three basic needs, for food and security and love, are so mixed and mingled and entwined that we cannot straightly think of one without the others." Preheat oven to 375 degrees. Heat the butter in a large skillet over medium heat. Add the onions and a sprinkle of salt and cook until beginning to soften, stirring often, about 5 minutes. Add the squash and another sprinkle of salt and a good crack of black pepper. Cook until just tender, about 10 minutes. Stir in the sage and remove pan from heat — let cool for 10 minutes. Whisk the eggs and milk together in a large bowl — add a dash each of salt and pepper. 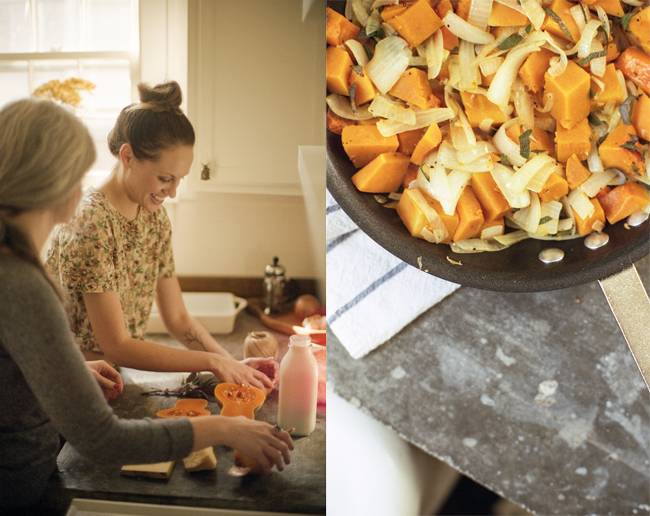 Add the bread, cheese, and squash — stir to combine. Pour into a buttered 9x13 baking dish. Bake until golden brown and set, 50 minutes to an hour. Remove from the oven, let cool for a few minutes. Top with dollops of pesto and serve!